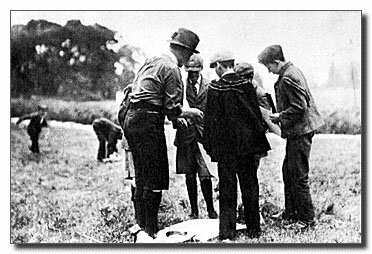 In 1907, Baden Powell organised the event which resulted in the start of Scouting; a camp at Brownsea Island for a group of inner city boys. BP and boys on that first camp. Note the universal wearing of hats – a sign of the time, everyone wore a hat then. This camp was very successful and widely reported, with numerous boys clamoring to take part in such activities, with some groups of boys even starting their own Scout Groups – and finding the leaders. 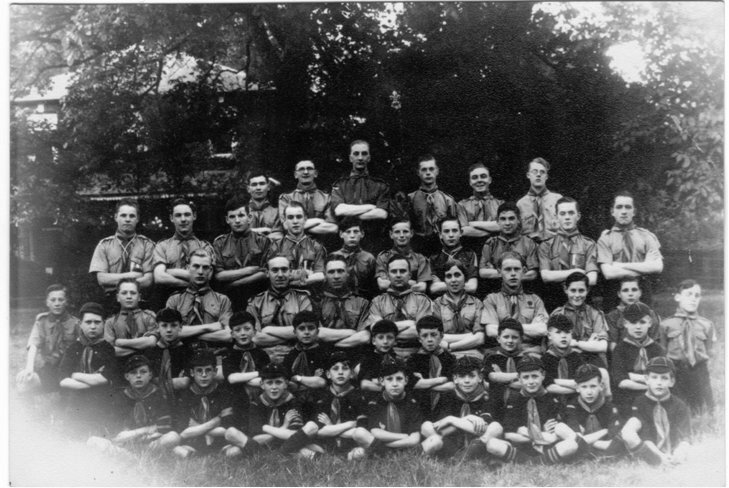 In 1909, The Scout Association was formed, and Scouting was regularised. The 1st St Albans was, as the name implies, the first official group in St Albans, and began life in 1908 with the formation of the Fox Patrol, possibly prefixed by 1st. One of the members of this patrol was Wilfred Crofts who remained with the 1st until the 1950s. He also attended the opening of the new headquarters in Watford Road in 1966. 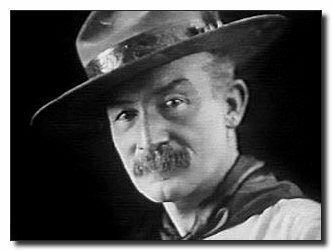 The Fox Patrol was formally registered, at what is now Baden-Powell House in London, as The 1st St Albans Troop in 1910 with the registration number of 126. The troop, as it was then, initially met in the Abbey Institute followed by Pageant House. 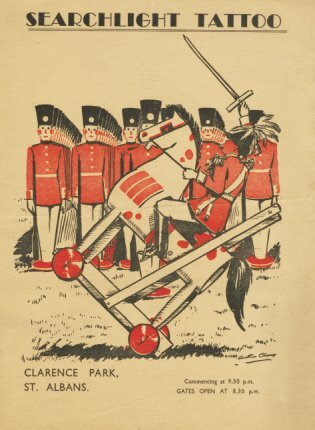 In 1934 over two evenings in July, a spectacular “Searchlight Tattoo” was put on at the at Clarence Park football ground. Vast crowds flocked to see the event that did not start until 9.45 pm. This was a very ambitious event and included the support of The Garnock Choral and Orchestral Society that had a choir of 60 and an orchestra of 36, as well as the St Albans Prize Silver Band and the pipers and drummers of the First South West Herts Scout Group. Special trains were put on to transport people back to London and intermediate stations in the early hours. It was estimated that 10,000 people attended. During the two afternoons, there were performances of the “Toy Soldier Tattoo” put on by the Wolf Cubs, and a special display by the Drum and Fife Band of the Second Battalion Coldstream Guards. A copy of the programme in pdf format is here, but is a large file at nearly 6 megabytes. When all was accounted for, the group had made £50 profit – which at 2014 prices is about £4000. In 1938 the 1st moved to its own new HQ in Orchard Drive off Holywell Hill. Mr Humphrey King who lived close by in Orchard House, next door to the 1st’s hut, objected to the metal roof and consequently had it thatched at his own expense, although it had later reverted to a metal roof by the 1950s. The 1st’s Rovers met in this hut in a room named after Mr Salwey who help to reform the 1st after the First World War. Between the two Wars membership increased and two troops were formed. The Scout Masters being Mr Don Green and Mr Leslie Berry with Mrs Crofts running the Cub Pack. CORNWELL DECORATION. Geoffrey Berry, Cub, 1st St. Albans. 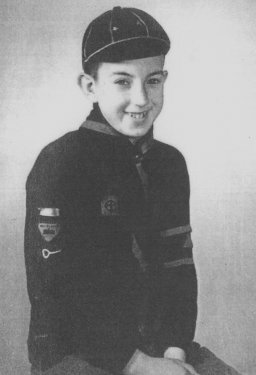 The Cornwell Decoration for courage and fortitude has been awarded to Cub Geoffrey Berry, of the 1st St. Albans Group, for exceptional courage and endurance during illnesses necessitating sixteen operations. Cub Berry is ten-and-a-half years old, and for a long time has been suffering from three diseases affecting the lungs, ears and throat. His operations have all been followed by long periods away from home, but he has never been known to complain of this or of the pain he must have suffered. He is delightfully self-forgetful in his interests, but more remarkable still is his return to normal duties of worship, work and play without a word of self-advertisement or self-pity. Under all these circumstances Cub Berry has gained his two Stars (test of efficiency) doing much of the work required in hospital. Geoffrey is at present in hospital for what is hoped will be his final operation. In 1958 the group celebrated its 50th anniversary, and among the activities to mark this occasion, published a slim booklet detailing the basic events in the groups life so far. A scanned copy can be downloaded here in pdf format but is a large file at nearly 5 megabytes.